The competition for finding molecules with ever-closer non-bonding H…H interactions is heating up. I have previously blogged about 1, a in,in-Bis(hydrosilane) designed by Pascal,1 with an H…H distance of 1.57 Å, and also blogged about 2, the dimer of tri(di-t-butylphenyl)methane,2 where the distance between methine hydrogens on adjacent molecules is 1.566 Å. The x-ray structure of 3 shows the in,in relationship of the two critical hydrogens, HA and HB. Though the positions of these hydrogens were refined, the C-H distance are artificially foreshortened. 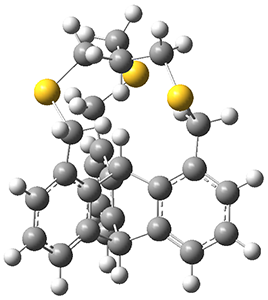 A variety of computed structures are reported, and these all support a very short H…H non-bonding distance of about 1.52 Å. The B3PW91-D3/cc-pVTZ optimized structure is shown in Figure 1. Figure 1. B3PW91-D3/cc-pVTZ optimized structure of 3. The authors also note an unusual feature of the 1H NMR spectrum of 3: the HB signal appears as a double with JAB= 2.0 Hz. B3LYP/6–311++G(2df,2pd) NMR computations indicated a coupling of 3.1 Hz. This is the largest through-space coupling recorded. 1. Zong, J.; Mague, J. T.; Pascal, R. A., "Exceptional Steric Congestion in an in,in-Bis(hydrosilane)." J. Am. Chem. Soc. 2013, 135, 13235-13237, DOI: 10.1021/ja407398w. 2. Rösel, S.; Quanz, H.; Logemann, C.; Becker, J.; Mossou, E.; Cañadillas-Delgado, L.; Caldeweyher, E.; Grimme, S.; Schreiner, P. R., "London Dispersion Enables the Shortest Intermolecular Hydrocarbon H···H Contact." J. Am. Chem. Soc. 2017, 139, 7428–7431, DOI: 10.1021/jacs.7b01879. 3. Xiao, Y.; Mague, J. T.; Pascal, R. A., "An Exceptionally Close, Non-Bonded Hydrogen–Hydrogen Contact with Strong Through-Space Spin–Spin Coupling." Angew. Chem. Int. Ed. 2018, 57, 2244-2247, DOI: 10.1002/anie.201712304.